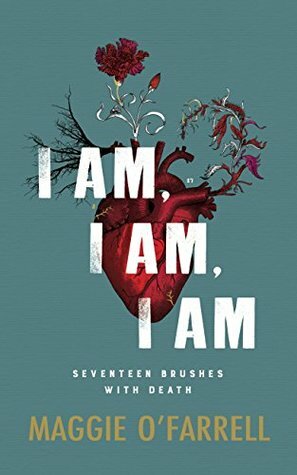 This week I’m featuring I Am, I Am, I Am: Seventeen Brushes with Death by Maggie O’Farrell, one of the books I’m currently reading. On the path ahead, stepping out from behind a boulder, a man appears. Suddenly the plane is falling, dropping, plummeting, like a rock fallen from a cliff. The downward velocity is astonishing, the drag, the speed of it. It feels like the world’s most unpleasant fairground ride, like a dive into nothing, like being pulled by the ankles into the endless maw of the underworld. My ears and face bloom like petals of pain, the seatbelt cutting into my thighs as I am thrown upwards. Turning for Home by Barney Norris, a beautifully and lyrically written novel. I loved this. It’s set on the day of Robert’s 80th birthday celebration and the narrative alternates between Robert’s and his granddaughter Kate’s stories, reflecting on their lives. The Wicked Cometh by Laura Carlin, historical fiction set in England in 1831 – a tale of wickedness and evil. Although this begins well, it drags in the middle and ends with a final twist I didn’t find convincing. The Confession by Jo Spain, a standalone book, set in Ireland. Banker, Harry McNamara, recently cleared of multiple accounts of fraud, is brutally attacked in his home in front of his wife, Julie. I was gripped by this story and I had to read it quickly to find out what really happened. I didn’t get round to writing reviews for the other books, so here are a few notes on two of them, both books that I enjoyed. Both are written achronologically which took a bit of getting used to, but it worked well. This meant that with both books you have to be on your toes, so to speak, to keep track of where you are and who is who. And I really should have made notes as I read – and written about them not long after I finished them! Notes From An Exhibition by Patrick Gale. It’s been a month since I finished reading this and unfortunately the details are rather vague in my mind now. Artist Rachel Kelly, a manic-depressive, subject to highs and lows is found dead in her Penzance studio, leaving her family with lots of unanswered questions. It becomes clear that her Quaker husband knew nothing about her early life. The narrative moves backwards and forwards from the past to the present and is told from different characters’ perspectives. It reminded me a bit of Sylvia Plath’s The Bell Jar in parts. I enjoyed the sections on Quakerism and working out the puzzle of Rachel’s life and her relationships. But I wasn’t sure about the ending – I should probably re-read the book. After You’d Gone by Maggie O’Farrell – her debut novel. The main character, Alice is in a coma after being in road accident, which may or may not have been a suicide attempt. She has been grieving the death of her husband, John. It’s quite a complicated story, following the life stories not only of Alice, but also those of her mother, Ann (who I didn’t like much), her grandmother, Elspeth (who I did like very much), her two sisters and of John. What was it that Alice saw at Edinburgh station that shocked her so much? You don’t find out until the end of the book, although I did have an idea before that what it meant to her and why it was so upsetting. I’ve already started to re-read it as I’m sure there’s a lot I missed on my first reading, especially as some of it is written in the present tense. And I may write a more detailed post at some point. Robert Riordan tells his wife Gretta that he’s going round the corner to buy a newspaper. He doesn’t come back. The search for Robert brings Gretta’s children – two estranged sisters and a brother on the brink of divorce – back home, each with different ideas as to where their father might have gone. None of them suspects that their mother might have an explanation that even now she cannot share. I thought the novel would be mainly about Robert’s disappearance and I was wrong, for that isn’t discussed very much until the last quarter of the book. From the opening paragraphs, which I thought were wonderful (see this post) the novel is then concerned with Gretta and her grown-up children – their childhood years, current situations and their relationships. All of which is fascinating in itself but I wanted to know about Robert. And Robert as a character is only seen through the others’ eyes. I think it was this aspect of the book that bothered me- Robert is not only missing, he is missing from the book itself. Whilst I was reading this, Ian Rankin’s splendid book, Saints of the Shadow Bible came out and I abandoned Instructions for a Heatwave and lost myself in the Rebus/Fox crime mystery. Coming back to Maggie O’Farrell’s book, I realised that I was approaching it in the wrong way; it’s a character driven book, not plot driven. But, having said that the last quarter of the book, or so, moves much more quickly, things happen and the mystery of Robert’s disappearance is resolved. The characterisation is very good, I could imagine all the people, and got infuriated at some of their behaviour. They’re not very likeable people but as I read on they did grow on me, especially Aoifa, who has undiagnosed dyslexia! But the heat that was definitely a presence in beginning of the book gets lost as the back story is developed. Whilst I found the mix of present and past tense a bit annoying it certainly clarified what were and what weren’t flashbacks. I’m still in two minds about the book, for me it was both disappointing and compelling reading. I would really like to re-read this book some time, now I know what to expect and think maybe I’d appreciate more. It’s shortlisted for the 2013 Costa Novel Award, along with Life After Life by Kate Atkinson (I have an unread copy), Unexpected Lessons in Love by Bernardine Bishop (who died in July), All the Birds, Singing by Evie Wyld. I’d like to read all these! The winner will be announced on 6 January 2014. Every Tuesday Diane at Bibliophile by the Sea hosts First Chapter First Paragraph Tuesday Intros, where you can share the first paragraph or (a few) of a book you are reading or thinking about reading soon. I’ve just started to read Instructions for a Heatwave by Maggie O’Farrell. I loved an earlier book by her, The Hand That First Held Mine, and so far this one looks just as good. The heat, the heat. It wakes Gretta just after dawn, propelling her from her bed and down the stairs. It inhabits the house like a guest who has outstayed his welcome: it lies along corridors, it circles around curtains, it lolls heavily on sofas and chairs. The air in the kitchen is like a solid entity filling the space, pushing Gretta down onto the floor, against the side of the table. Only she would choose to bake bread in such weather. I like this opening, setting the scene and establishing the heat as a physical presence, a character to be reckoned with. This is July 1976 and London is in the grip of a heatwave. (It was not just London, because I remember it very well where I was living in Cheshire in the north-west.) Gretta’s husband pops out of the house to buy a newspaper – but he doesn’t come back – this is a story of a family in crisis. I’m drawn into this book right from the beginning – what do you think? Would you keep reading? Instructions For A Heatwave by Maggie O’Farrell – this was right at the top of a bookcase, far too high up for me to reach, but a helpful member of staff got it down for me. It’s one I’ve had on my wishlist since I read The Hand that First Held Mine, which I thought was excellent. This is her sixth book and is a portrait of a family in crisis during the heatwave in 1976. The Shooting Party by Isabel Colegate – this is the book to read in October for Cornflower’s Reading Group. I read about on the morning I was going to Barter Books was amazed to find a good hardback copy just as though I’d reserved it. The shooting party takes place in autumn 1913 – ‘Here is a whole society under the microscope, a society soon to be destroyed.’ I began reading it in the shop whilst having a cup of coffee and it promises to be really good. I’ve just finished reading Maggie O’Farrell’s book, The Hand That First Held Mine, which won the 2010 Costa Novel Award. I loved it, but it’s such a sad story. It’s beautifully written, so much so that it took me a while to realise that for the most part it’s written in the present tense. This is a book set in two time periods about two families and immediately I wondered what the link could be. There’s Lexie Sinclair who we meet at the end of the 1950s and Elina and her boyfriend Ted in the present day. Lexie is young and in love with journalist Innes Kent. Elina is struggling after the traumatic birth of her baby and Ted is worried about her. Then strange things happen to Ted as forgotten memories of his childhood rise to the surface of his mind. Listen. The trees in this story are stirring, trembling, readjusting themselves. A breeze is coming in gusts off the sea, and it is almost as if the trees know, in their restlessness, in their head-tossing impatience, that something is about to happen. The garden is empty, the patio deserted, save for some pots with geraniums and delphiniums shuddering in the wind. A bench stands on the lawn, two chairs facing politely away from it. A bicycle is propped against the house but its pedals are stationary, the oiled chain motionless. A baby has been put out to sleep in a pram and it lies inside its stiff cocoon of blankets, eyes obligingly shut tight. A seagull hangs suspended in the sky above and even that is silent, beak closed, wings outstretched to catch the high thermal draughts. And we forget because we must. I can visualise the scene, feel the breeze and find myself holding my breath copying out these paragraphs from the book, waiting with bated breath to find out what is going to happen.